Covelli Loyce "Coco" Crisp  (born November 1, 1979) is an American former professional baseball outfielder. He played in Major League Baseball (MLB) for the Cleveland Indians, Boston Red Sox, Kansas City Royals, and Oakland Athletics. While primarily a center fielder throughout his career, Crisp also played left field for the Athletics and during his stints with the Indians. With the Red Sox, he won the 2007 World Series over the Colorado Rockies. Crisp was born in Los Angeles on November 1, 1979. He is the son of Loyce Crisp, a fast food restaurant owner and former amateur boxer, and Pamela Crisp, a former champion sprinter. He is a graduate of Major League Baseball's Reviving Baseball in Inner Cities Program. His maternal grandfather is Nick Newton, masters world record holder and inventor of cast aluminum starting blocks. He played on the 1995 Senior Division RBI World Series champions from Los Angeles. Fast food is a type of mass-produced food designed for commercial resale and with a strong priority placed on "speed of service" versus other relevant factors involved in culinary science. Fast food was originally created as a commercial strategy to accommodate the larger numbers of busy commuters, travelers and wage workers who often did not have the time to sit down at a public house or diner and wait for their meal. By making speed of service the priority, this ensured that customers with strictly limited time were not inconvenienced by waiting for their food to be cooked on-the-spot. For those with no time to spare, fast food became a multibillion-dollar industry. Cocoa Krispies, Choco Krispis, Choco Krispies, Coco Pops, or Choco Pops is a breakfast cereal produced by Kellogg's, coming both as a boxed cereal and as a snack bar with a 'dried milk' covered bottom. It is a cocoa flavored version of Rice Krispies. Containing a substance imitating milk chocolate, the cereal can turn milk "chocolatey." The St. Louis Cardinals selected Crisp in the seventh round of the 1999 MLB Draft. In his minor league career, Crisp played for Cardinals affiliates in four different leagues from 1999 to 2001 and was the Cardinals 2001 Minor League Player of the Year. He opened the 2002 season with the New Haven Ravens, then the Double-A Eastern League affiliate of the Cardinals. He was traded to the Cleveland Indians on August 7, 2002, to complete an earlier trade for pitcher Chuck Finley. In the Indians organization, he played for their Double-A affiliate, the Akron Aeros, and their Triple-A affiliate, the Buffalo Bisons. Crisp had 69 hits, one home run, and 24 RBI before being called up by the Indians. Crisp never had any major league experience with the Cardinals. The St. Louis Cardinals are an American professional baseball team based in St. Louis, Missouri. The Cardinals compete in Major League Baseball (MLB) as a member club of the National League (NL) Central division. Busch Stadium has been their home ballpark since 2006. One of the most successful franchises in baseball history, the Cardinals have won 11 World Series championships, the second-most in Major League Baseball and the most in the National League. Their 19 National League pennants rank third in NL history. In addition, St. Louis has won 13 division titles in the East and Central divisions. The Cleveland Indians are an American professional baseball team based in Cleveland, Ohio. The Indians compete in Major League Baseball (MLB) as a member club of the American League (AL) Central division. Since 1994, they have played at Progressive Field. The team's spring training facility is at Goodyear Ballpark in Goodyear, Arizona. Since their establishment as a major league franchise in 1901, the Indians have won two World Series championships: in 1920 and 1948, along with 10 Central Division titles and six American League pennants. The Indians' current World Series championship drought is the longest active drought. 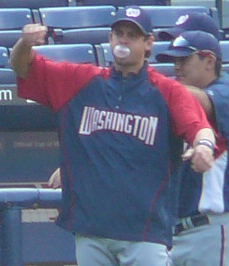 Crisp became the starting center fielder with the Indians in mid-2002, replacing the injured Matt Lawton. For the next few seasons, Crisp established a reputation as an excellent fielder and speedy baserunner. Despite his success, Crisp had to fight for his roster spot each spring. In 2005, Crisp moved to left field following the emergence of another young outfielder, Grady Sizemore. In his final two seasons with the Indians, Crisp showcased his offensive talent by batting .297 and .300 with 31 total home runs and 35 steals. Matthew Lawton, Jr. is an American former professional baseball player whose career spanned 15 seasons, including 12 seasons in Major League Baseball (MLB). Lawton, an outfielder, made his major league debut September 5, 1995, with the Minnesota Twins, who signed him four years prior. He also played in the majors with the New York Mets (2001), the Cleveland Indians (2002–04), the Pittsburgh Pirates (2005), the Chicago Cubs (2005), the New York Yankees (2005), and the Seattle Mariners (2006). Over his major league career, Lawton compiled a .267 batting average with 1,273 hits, 267 doubles, 17 triples, 138 home runs, 631 runs batted in (RBIs), 165 stolen bases, and 681 walks in 1,334 games played. Grady Sizemore is an American former professional baseball outfielder. He played in Major League Baseball (MLB) for the Cleveland Indians from 2004 through 2011, but did not play in the majors for the following two years after back and knee injuries. He returned in 2014 with the Boston Red Sox and played for the Philadelphia Phillies from 2014 to 2015 before finishing 2015 with the Tampa Bay Rays. He was a three-time MLB All-Star and a two-time Gold Glove Award winner. He also won a Silver Slugger Award. Johnny David Damon is a former American professional baseball outfielder who played in Major League Baseball (MLB) from 1995 to 2012. In his MLB career, Damon played for the Kansas City Royals (1995–2000), Oakland Athletics (2001), Boston Red Sox (2002–05), New York Yankees (2006–09), Detroit Tigers (2010), Tampa Bay Rays (2011) and Cleveland Indians (2012). Damon also played for the Thailand national baseball team and was a member of the squad for the 2013 World Baseball Classic qualifiers. Crisp playing for the Boston Red Sox in 2007. Crisp signed a three-year contract extension worth $15.5 million. [ citation needed ]  Crisp broke his left index finger attempting to steal third base and spent the next 42 games on the disabled list and then finished the season with a broken left index finger. After returning to the Red Sox outfield on May 28, Kevin Youkilis had taken over the leadoff spot, and Crisp usually batted 7th or 8th in the line-up for the rest of the year. In 105 games, he had a .264 batting average with 8 home runs and 36 RBI. Besides his injury, Crisp's 2006 season may be best remembered for a catch against the New York Mets on June 29. Crisp began the 2007 season struggling offensively due to lingering effects of off season surgery to his left index finger . On April 20, 2007, Crisp fell over a short wall at Fenway Park while trying to catch a home run by Alex Rodriguez. Although he was unable to make the catch, missing by inches, he hit a game-tying triple off Mariano Rivera in the bottom of the eighth, then scored the go-ahead run on Alex Cora's soft line drive single. The Red Sox went on to win 7–6. During this season, he made numerous impressive catches in the outfield. It has even been claimed by one major league club that Crisp is easily the best defensive center fielder in all of Major League Baseball. Although he struggled at the plate throughout much of the season, between June 13 and July 23, Crisp raised his batting average from .221 to .284, a .402 average during that span. On June 18, entering the game with only two home runs in the season, Crisp belted two homers in the first multi-HR game of his career in a 9–4 loss to the Atlanta Braves. On October 21, in Game 7 of the American League Championship Series, Crisp made the catch that sent Boston to their second World Series in four seasons. He hit the wall shortly after making the catch, minorly injuring himself in the process. Despite this, he was well enough to play in the World Series. Although he was the team's starting center fielder throughout the 2007 season, he was benched mid-series during the ALCS for rookie Jacoby Ellsbury. He remained benched for the 2007 World Series, only appearing late in games for defensive substitutions. Bench-clearing brawl on June 5, 2008. On June 4, Crisp was the center of controversy in a game against the Tampa Bay Rays. While Crisp was trying to steal second base in the bottom of the sixth inning, Rays shortstop Jason Bartlett purposely placed his knee in front of the bag in an attempt to prevent Crisp from stealing the base. Crisp stole the base, but was not happy with this. On base again in the bottom of the eighth inning, he attempted another steal, this time taking out second baseman Akinori Iwamura on a hard slide. His slide was controversial and catalyzed the "payback pitch" the following game. During a pitching change in that inning, Rays manager Joe Maddon and Crisp argued, with Crisp in the dugout and Maddon on the pitching mound. After the game, Crisp said that he thought Bartlett would cover the bag, instead he (Bartlett) chose to tell Iwamura to take the throw in the eighth inning. Crisp described Bartlett's knee in front of the bag as a "Dirty" play. The very next game, in Crisp's first at bat in the bottom of the second, leading off the inning with the Sox up 3–1, Rays starter James Shields hit him on the thigh on the second pitch. Crisp charged the mound and first dodged a punch from Shields, and then threw a glancing punch at Shields, which set off a bench-clearing brawl. Crisp, Jonny Gomes, and Shields were ejected from the game. Major League Baseball suspended Crisp for seven games due to his actions in the brawl. Upon appeal, the suspension was reduced to five games, which he had served as of June 28, 2008. In Game 5 of the ALCS, Coco Crisp had a game-tying hit in the bottom of the 8th inning to cap Boston's 7-run comeback. Boston would go on to win the game 8–7 with a walk-off single in the ninth inning by J. D. Drew, but lose the series in 7 games. Crisp with the Kansas City Royals in 2009 spring training. On October 10, 2012, in Game 4 of the 2012 American League Division Series against the Detroit Tigers, Crisp came to bat in the bottom of the ninth inning. The score was tied 3–3, there were 2 outs and a runner on second base (Seth Smith). The A's were down 3–1 entering the inning, but subsequently tied the game with three straight hits off Detroit pitcher José Valverde, thus setting the stage for Crisp. He came through with a walk-off single to right field that scored Smith, giving the A's a 4–3 win and forcing a decisive Game 5. On October 11, 2012 the Tigers finished off the series with a 6–0 victory over the A's. On October 10, 2016, against the Boston Red Sox in Game 3 of the ALDS, Crisp hit a go-ahead two-run home run, which would eventually be the game-winner after the Indians won 4-3. The Indians' win propelled them to the ALCS against the Toronto Blue Jays. It was Crisp's second career postseason home run. However, he and the Cleveland Indians could not hold on in the World Series, losing the Series in Game 7 to the Chicago Cubs. Aaron John Boone is an American former professional baseball infielder, broadcaster, and current manager for the New York Yankees of Major League Baseball (MLB). He is the son of Bob Boone, grandson of Ray Boone, and the brother of Bret Boone. He played in MLB for the Cincinnati Reds, New York Yankees, Cleveland Indians, Florida Marlins, Washington Nationals, and Houston Astros from 1997 through 2009. Christopher Trotman "Trot" Nixon is an American former professional baseball right fielder. He played in Major League Baseball (MLB) from 1996 through 2008, primarily with the Boston Red Sox from 1996 through 2006, with whom he was a fan favorite for his scrappy play and won the 2004 World Series, ending the Curse of the Bambino. His career wound down with limited appearances for the Cleveland Indians in 2007 and the New York Mets in 2008. He currently serves as co-host/analyst for "The 5th Quarter," a high school football highlight show on WWAY-TV in his hometown of Wilmington, North Carolina. Orlando Luis Cabrera, nicknamed "O-Cab" and "The OC", is a Colombian-American former baseball infielder. Kelly Brian Shoppach is an American former professional baseball catcher. He played in Major League Baseball (MLB) for the Boston Red Sox, Cleveland Indians, Tampa Bay Rays, New York Mets, Seattle Mariners and Pittsburgh Pirates. Scott Kendrick Cooper is a former Major League Baseball third baseman who played for the Boston Red Sox, St. Louis Cardinals, and Kansas City Royals during the 1990s. Jeremy Ryan Hermida is a former professional baseball outfielder. He has played in Major League Baseball (MLB) for the Florida Marlins, Boston Red Sox, Oakland Athletics, Cincinnati Reds and San Diego Padres, and in Nippon Professional Baseball for the Hokkaido Nippon Ham Fighters. He bats left-handed and throws right-handed. Andy Manuel Marte was a Dominican professional baseball third baseman. He played in Major League Baseball (MLB) for the Atlanta Braves, Cleveland Indians, and Arizona Diamondbacks. He also played in the KBO League for the KT Wiz. On January 22, 2017, Marte was killed in a car crash in the Dominican Republic. Rajai Lavae Davis is an American professional baseball outfielder in the New York Mets organization. He has previously played in Major League Baseball (MLB) for the Cleveland Indians, Oakland Athletics, Pittsburgh Pirates, San Francisco Giants, Toronto Blue Jays, Detroit Tigers, and Boston Red Sox. Akinori Iwamura is a Japanese baseball infielder, who currently is a player-manager for the Fukushima Hopes in Japan's Baseball Challenge League. He made his Major League debut with the Tampa Bay Devil Rays in 2007. William Joshua Reddick is an American professional baseball outfielder for the Houston Astros of Major League Baseball (MLB). He previously played for the Boston Red Sox, Oakland Athletics and Los Angeles Dodgers. Reddick won a Gold Glove Award in 2012. Andrew Scott Bailey is an American former professional baseball pitcher and current bullpen coach for the Los Angeles Angels of Major League Baseball (MLB). He played in MLB for the Angels as well as the Oakland Athletics, Boston Red Sox, New York Yankees, and Philadelphia Phillies. Bailey won the 2009 American League Rookie of the Year Award, and was an All-Star in 2009 and 2010, while he was the closer for the Athletics. Steven Richard Wright is an American professional baseball pitcher with the Boston Red Sox of Major League Baseball (MLB). Wright made his MLB debut in 2013, and was an All-Star in 2016. Wright is the only active MLB pitcher to throw a knuckleball. Mitchell Austin Moreland is an American professional baseball first baseman for the Boston Red Sox of Major League Baseball (MLB). He previously played for the Texas Rangers. Listed at 6 feet 2 inches (1.88 m) and 230 pounds (100 kg), Moreland both bats and throws left-handed. Jackie Bradley Jr., nicknamed JBJ, is an American professional baseball center fielder who plays for the Boston Red Sox of Major League Baseball (MLB). He stands 5 feet 10 inches (1.78 m) tall and weighs 200 pounds (91 kg). He was drafted by the Red Sox with the 40th overall pick in the 2011 MLB draft after being named the 2010 College World Series Most Outstanding Player while attending the University of South Carolina. He made his MLB debut in 2013, and was on the 40-man roster for the 2013 World Series champions, though he didn't play in the postseason. Bradley was an All Star in 2016 and he was named the most valuable player of the 2018 American League Championship Series. Maxwell Steven Muncy is an American professional baseball infielder for the Los Angeles Dodgers of Major League Baseball (MLB). He played in MLB for the Oakland Athletics in 2015 and 2016 and joined the Dodgers in 2018. ↑ "Coco Crisp Baseball Stats by Baseball Almanac". Baseball-almanac.com. Retrieved February 7, 2014. ↑ Dodd, Rustin. "Crisp shares a knockout story of his dad". MLB.com. Retrieved 27 August 2014. ↑ "MLB's RBI program enters 20th year | MLB.com: News". Mlb.mlb.com. May 24, 2013. Retrieved February 7, 2014. ↑ "Topic Index". Multimedia.foxsports.com. November 19, 2013. Archived from the original on October 4, 2011. Retrieved February 7, 2014. ↑ "Tribe finalizes two deals in a day". Major League Baseball. Retrieved 2016-09-10. ↑ "Cuckoo for Coco: Red Sox, Crisp agree to extension". ESPN.com. 2006-04-12. Retrieved 2016-09-10. ↑ boston.com Their only close call was a moose on the loose, Dan Shaughnessy, 8/6/2007. ↑ Gaddis, Carter (June 6, 2008). "Strikeouts Concern Maddon". The Tampa Tribune. ↑ Smith, Joe (June 5, 2008). "Red Sox retake first from Rays 5–1". St. Petersburg Times. ↑ Ortiz, Jorge L. (June 6, 2008). "Even MVPs can be benched for not hustling". USA Today. ↑ Amalie Benjamin (June 6, 2008). "Red Sox outfight Rays: Brawl precedes Ellsbury injury". Boston Globe . Retrieved June 27, 2008. ↑ "National Sports Briefs". Associated Press. June 7, 2008. ↑ Gordon Edes (June 27, 2008). "Crisp suspension reduced". Boston Globe . Retrieved June 27, 2008. ↑ "Royals acquire Coco Crisp from Red Sox for Ramon Ramirez". Kansascity.royals.mlb.com. Retrieved February 7, 2014. ↑ "Crisp to miss remainder of season". Kansascity.royals.mlb.com. Retrieved February 7, 2014. ↑ "Athletics close to deal with Crisp | oaklandathletics.com: News". Oakland.athletics.mlb.com. Retrieved February 7, 2014. 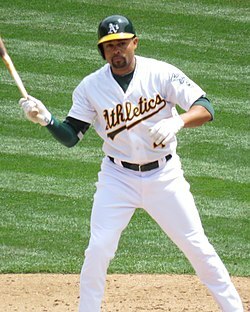 ↑ "A's agree to terms with OF Coco Crisp on one-year contract | oaklandathletics.com: Official Info". Oakland.athletics.mlb.com. Retrieved February 7, 2014. ↑ "Oakland A's Coco Crisp (fractured pinkie) to start year on disabled list - ESPN". Sports.espn.go.com. April 3, 2010. Retrieved February 7, 2014. ↑ "Oakland Athletics Exercise Coco Crisp, Mark Ellis Options, Decline Eric Chavez Option - SB Nation Bay Area". Bayarea.sbnation.com. Retrieved February 7, 2014. ↑ "AP Source: CF Coco Crisp agrees to deal with A's". The Boston Globe. ↑ "Coco Crisp staying with A's". Associated Press. ESPN.com. February 7, 2014. Retrieved February 7, 2014. ↑ Slusser, Susan. "Coco Crisp signs two-year extension, with 2017 option - Oakland Athletics : The Drumbeat". Blog.sfgate.com. Retrieved February 7, 2014. ↑ Slusser, Susan (August 15, 2016). "Coco Crisp 'hurt,' believes A's trying to prevent option". San Francisco Chronicle. Retrieved August 23, 2016. ↑ Hoynes, Paul (August 31, 2016). "Coco Crisp, the anti-Lucroy, could have nixed trade to Cleveland Indians, but didn't". Cleveland Plain Dealer. Retrieved September 1, 2016. ↑ Arthur, Blake (July 10, 2017). "Former MLB player Coco Crisp named new head baseball coach at Shadow Hills". kesq.com. Retrieved August 24, 2017. 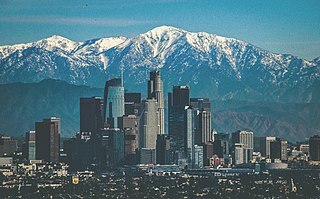 ↑ Lee, Jane (February 19, 2019). "Crisp joining A's radio team as analyst". MLB.com. Retrieved February 25, 2019. ↑ "Coco Crisp continues to improve franchise record" Accessed July 4, 2012. ↑ Weinberg, Neil (January 13, 2017). "The Man Who Hasn't Been Hit in Almost Six Years". FanGraphs. Retrieved January 14, 2017. ↑ Murphy, Rosalie (May 24, 2016). "Coco Crisp selling Rancho Mirage mansion for $9.99M". The Desert Sun . Palm Springs, California: USA Today Network. Wikimedia Commons has media related to Coco Crisp .